Cancer is as common in dogs as it is in people. One statistic many veterinarians toss around is 50 percent of all dogs past 10 years old will die of cancer. I have had my share of dogs with cancer. However, with Hope this is the first time we are being aggressive about treating it. Hope has B-Cell Lymphoma. We are treating it with the CHOP method of chemotherapy. If you are interested in learning more about this, feel free to leave a comment and your email and I will get back to you or direct message me on Twitter @daysofourdogs. Hope is tolerating the chemo well, so we are not torturing her. She is losing her fur. In a nutshell, we have a good chance to keep Hope in remission, but a much smaller chance for a cure. I have been asked why are we taking the time and expense to have chemo. My answer is fairly complex. 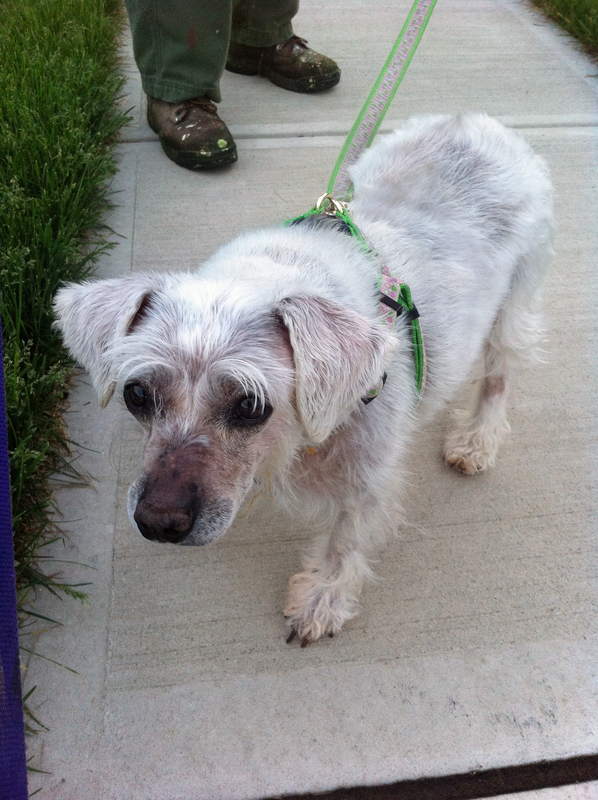 Hope spent five years getting pregnant as often as possible in an Amish puppy mill in Ohio. When she was “used up,” she was to be shot and thrown in a ditch. A courageous woman saved her and took her to Schnauzer Rescue Cincinnati. After about 9 months in a wonderful foster home, we brought her to our home in September 2009. Out of the puppy mill for more than two years and about 1 and ½ years with us is not long enough for her to enjoy life as a normal dog. She now can feel the earth beneath her feet and the sun and wind on her face. She is clean and groomed regularly. Hope knows happiness when she gets to take walks. She is excited to bark at squirrels and rabbits. She enjoys the attention she gets from Jake and Windy. Tasty bites of beef and chicken seem to make her day. She is fed quality food, has access to toys, and, most of all, freedom and love. As long as there is a chance, and Hope is not suffering, we will see to it she can enjoy as many normal days as she can – free from a wire cage as a breeding machine. This entry was posted in Dog Behavior, Dog Health, Puppy Mills, Schnauzers and tagged Amish, Cancer, dog health, puppy mills, Schnauzers. Bookmark the permalink.